December 5, 2011 - The daring cliff-side rescue of a lucky British Columbia which pushed both the rescue crew and their search and rescue helicopter to the limits has been selected for this year’s winner of the Cormorant Trophy for Helicopter Rescue. The Cormorant Trophy for Helicopter Rescue recognized the "Canadian civilian, government or military crew that has performed the most demanding helicopter rescue of the year." The Trophy is presented annually by AgustaWestland, a Finmeccanica company. The selection is made by a panel of judges which includes representatives of the Canadian Forces and Canada’s aerospace journalists. “This was one of the most challenging missions of my career,” Capt. Leroux told the Canadian Forces at the time of the rescue. On the night of December 23, 2010, the Cormorant helicopter “Rescue 907” stationed with 442 Squadron at CFB Comox, was dispatched to rescue a 23-year-old man who was stranded on a steep side of Hat Mountain in Cyprus Provincial Park, B.C. The Cormorant crews were racing against time, with powerful winter storm approaching. Unless the rescue could be carried out, the man would be stranded for days without the necessary provisions to survive. The stranded hiker was located at 1,600 meters up the mountain, 150 meters into dense clouds, in a narrow and steep bowl. As the crew approached in their AW101 “Cormorant” helicopter, they were battered by the turbulence of 85 kph wind gusts blowing straight down the mountain. This forced the pilots to fight rapid power swings, causing significant rotor speed changes which made accurate control of the helicopter very difficult. Using night vision gear, the search team was only able to make out a faint light, which they hoped was their rescue target. “We reached the estimated location of the hiker by slowly flying up the side of the mountain,” said Capt. Leroux. “We had to attempt multiple passes until the visibility was good enough for us to fly over the man’s location.” Each of these approaches pushed the helicopter with its three powerful engines to its limit. Normally, the “maximum” speed or power required for missions in an AW101 Cormorant reached about 80%, but during this rescue, the power fluctuated up to 117%, giving constant warning alarms. Facing the high risk of an avalanche, the crew decided on a fast extraction with the SARTech remaining attached to the hoist. The flight engineer then directed the aircraft about seven meters above the hiker with a vertical rock face just one-and-a-half to three meters in front of the rotor blades. The flight engineer lowered the SARTech who quickly hooked up the rescue subject and both men were hoisted on board. Throughout this procedure, the snow was being whipped around the helicopter enveloping it in a “snowball” drastically reducing the pilots’ visibility. As they went to fly away, a thick layer of cloud moved in, making it impossible to backtrack the way they came in. With almost no visibility, the flight crew managed to extract the helicopter from the cliff confines relying only on instrumentation to show them the way out. The crew flew to Lyons Bay soccer field, where the man was transferred to a land ambulance to be taken to hospital for treatment for mild hypothermia. The Cormorant Trophy is named after the AW101 (former EH101) “Cormorant” medium-heavy lift helicopter used as the Canadian Forces’ primary search and rescue helicopter. Over 190 AW101 helicopters have been sold to civil and military customers around the world in a wide variety of configurations. Canada’s fleet of 14 Cormorants has performed in excess of 45,000 hours and has a 98.4% mission dispatch reliability, the best of its class. The worldwide fleet has flown in excess of 250,000 hours in Canada, UK, Italy, Denmark, Portugal, and Japan providing exceptional performance and an extremely high degree of safety. “Each year, Canadian Forces search and rescue teams conduct thousands of missions on Cormorant helicopters saving dozens of lives,” said Jeremy Tracy in presenting the award. “The calibre of all the rescue nominations this year made the selection committee’s job quite a challenge. 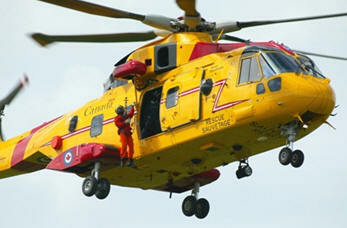 The winning rescue was selected from among five nominees from SAR squadrons across Canada. Members of 442 Squadron stationed at Canadian Forces Base Comox – Capt. Jean Leroux, Aircraft Commander; Maj. Troy Maa, First Officer; Sgt Carl Schouten, Flight Engineer; and search and rescue technician (SARTech) Master Cpl Nicholas Nissen, were presented with their trophy on November 26, 2011 by Jeremy Tracy, AgustaWestland’s Head of Region – Canada, accompanied by Canada’s Chief of Defence Staff, General Walter Natynczyk and base commander Col. Jim Benninger.